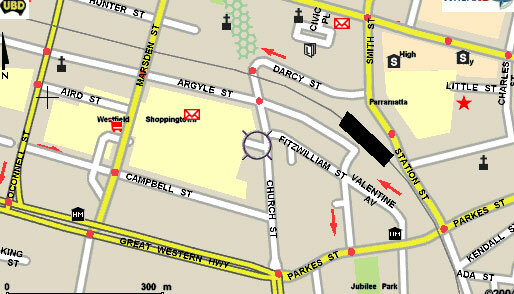 Shine Music school is located next to Parramatta Westfields in the central business district of Parramatta and is easily accessible by car, train and bus from all over the western suburbs of Sydney. There is very convenient free parking across the street from us. If you are coming for the first time, it is best to find parking first before looking for our studios. Remember to call us if you have trouble finding us. Above are photos of where Shine Music School is located. 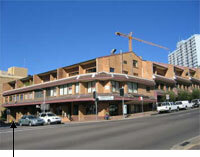 Fig A is a photo of our studio facing Aird St, and Fig B is the corner of Aird and O’Connell St which is where our studio is located. The entrance to our studios is actually located on the Aird St Side of the building in Fig B and is indicated by the arrow. 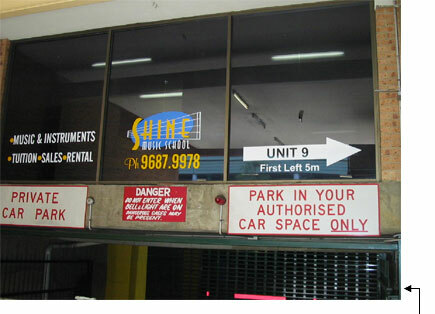 There is free parking in Parramatta Westfields, across the street from Shine Music School. 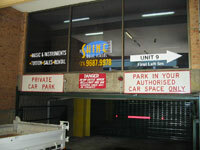 The Aird St Parking lot is the closest to Shine Music School and the most convenient. Once at the bottom of the escalators exit the shopping centre and turn left and walk up Aird St.
We will be on the left hand side of Aird St and you will see our window facing the street. On Saturdays and after 6:30pm, the main entrances to the our premise are actually shut. We however have a doorbell hung out underneath our window in the driveway. 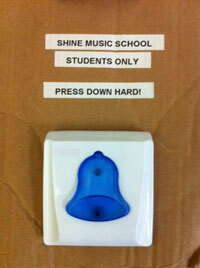 Please ring this doorbell, wait at the green door facing the street and we will come out to open the door for you! If you can’t find us call us on 96879978 for assistance. Shine Music School currently has about 250 students from all over Sydney, we are very accessible and convenient with so many facilities around us.